Yeah, yeah you’re going to unsubscribe from all those emails one of these days. That requires A LOT of time; way more time than just deleting them today. Why don’t we deal with that little (really big) number over our email icon on our screen? How do we have time to double tap (double!) 30+ likes on IG or text paragraphs of our daily complaints but we cannot seem to clear out our inboxes? By the way, someone has already told us that there’s peace in empty spaces. So why, why, why do we insist on keeping them cluttered? Having a large number over that popular envelope on your phone doesn’t give you the same satisfaction as seeing a double digit numbers over you text icon. You are not being loved by real people, you are being haunted by strangers. Does it seem creepy now? You’re giving space in your life to people you do not know that want to make you either spend your money, find an excuse to bring more things into the tiny box you already live in, or remind you of all the trips you cannot afford to be taking for a flight + hotel as low as $699. DELETE. DELETE. DELETE. Power to you if your willing to completely delete your actual email address and create a brand new one! I personally choose to clean up my messes but some people work better with a fresh start. But, just to let you know, you cannot delete everything completely in life and have fresh start everywhere so, this may be a good way to practice cleaning up your mess. So, perhaps you’ve been convinced to start bringing down that number to double digits or maybe even single ones (heart eyes at you). How do you not spend 3 hours of today doing it? Spread it out. Be patient. Make sure you finish. Although you already know the following advice try to say it to yourself daily and constantly. “Finish what you start.” No successful runner avoids the finish line so, finish what you start; preferably today if the circumstances permit you to do so. But you finish everything you start right? I really mean everything though, from the most little things you do, example: if you open the cabinet – close it, if you took out the milk – put it back when you’re done, if you folded laundry – put it away, if you want to go to the gym – GO. We don’t realize that everything begins with thought and it’s a great time to begin implementing on our thoughts. Back to deleting. For today make sure that every time you unlock your phone your first tap is to your email and check 30x on emails you’re ready to delete. Breathe, if you really miss them by tonight, they’ll be in your trash folder and no-one will know you took them back into your inbox. If you’re like me you probably slide to your home screen 10 seconds after you’ve closed it (weirdo). This will make you clean up plenty of emails to have you wanting to clean more and if by the time you’re in bed you find yourself determined to keep cleaning, you’re welcome. 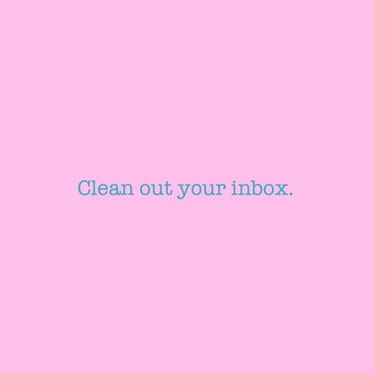 Even if your inbox seems to be less than 1% of what’s unorganized or cluttered in your everyday, cleaning up that little bit is a start. Gaining about 1% of overall controlled peace, is still peace. Filling your days with accomplishments regardless of their size is imperative to your happiness. It’s about ridding the excess, keeping what’s essential to you; not what’s essential to those you love or surround you; let them figure out what they need it’s not your job and it’s wasting your valuable time that you will never get back. Emails are not essential to anyone. Once you have a clean inbox, free of dust and holiday emails from your ex, make it a priority to delete or read your emails daily during lunch (or whatever meal is your favorite to creep on people that are unaware that they’re your best friend). YOU MUST DO THIS DAILY or you will have done the beginning for nothing. After all, what’s the point of cleaning if you’re just going to keep it dirty. We’re not Good anymore. Goodbye.